In addition to the connectors applicable toCF type I cards, those for CF type II cards are also available. 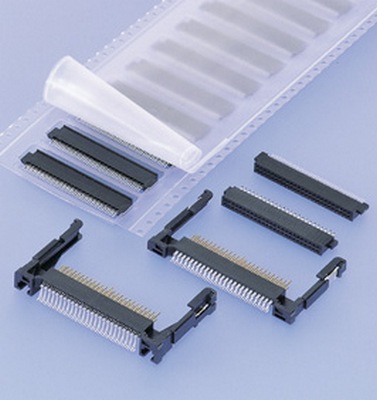 Both dual-row straddle type and single-row SMT type sockets are available. Single-row SMT type has three kinds, that is, with off-set 0.2mm (.008"), 0.35mm (.014"), and 0.75mm (.030"). The SMT type sockets have grounding springs at the No.1 & No.26 circuits. For the card frame for type I cards, ultrasonic welding method is applied, which is superior in strength, heat-resistance with shorter assembly time. The adapter converts the CF type I card to PCMCIA type II card. The new type that has contact spring for grounding clip has been lined up, responding to CF type I card with grounding clip. The adapter converts the CF type I and II card to PCMCIA type II card. Shutter mechanism with lock is applied to protect pins. The new type that has contact spring for grounding clip has been lined up, responding to CF type I card with grounding clip. Available both in normal and reverse types, with stand off 0mm or 1.64mm (.065") each. The assembly of the ejector mechanism to the mounted header is a simple one-touch operation. Available in either with right button or left button. With stand off 0mm, both normal and reverse types are available. This header has a spring which serves as solder tab/grounding clip integrated device. The assembly of the ejector mechanism to the mounted header is a simple one-touch operation. The ejector for reverse type header has right button, with onepoint pushing mechanism, while the ejector for normal type header has left button, with two-point pushing mechanism. Available both in Normal type with stand-off 1.85mm (.073") and in reverse type with stand-off 0mm. The header is supplied in embossed tape packaging, for mounting by automatic placement machines. Two-point pushing mechanism has been adopted. Right button for normal type header and left button for reverse type header.